When I was in college at the University of Central Florida (Go Knights!) I was introduced to many leaders in the community who had been very successful entrepreneurs that transitioned into successful angel investors and/or venture capitalists. 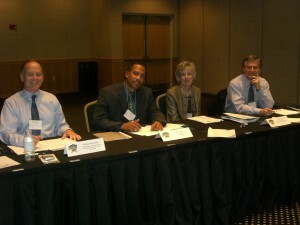 I had the opportunity to pitch many of these investors during business plan competitions. You could think of these competitions like SharkTank, before SharkTank, with prize money instead of investment capital. I won two business plan competitions and was finalists in a state and national competition. I received press mentions, trophies and about $20,000 in cash over two years…however I gained something far more valuable. A clear vision of what I wanted to become. I wanted to be in that chair and have entrepreneurs pitching me for investment. Not just for college competitions, but for real (I have been invited back to UCF and to UF to judge business competitions). I wanted to not only be able to pursue and invest in my own ventures, but work with other aspiring entrepreneurs and help them grow by providing business wisdom, marketing assistance and in some cases capital and/or resources invested into their venture. After I graduated I decided to build a foundation that would allow me to learn about many types of different businesses, connect with entrepreneurs and utilize my marketing skills to help companies grow. I decided to start a marketing agency in 2009 that could serve various businesses and my own ventures. I named it Brand Advance. Over the last five years I have personally worked with over 1,000 different businesses through Brand Advance. Many of these businesses were past the startup stage and were growth companies (over $1M in revenue). Some of these businesses sought marketing assistance to help them increase sales, but were facing problems that marketing alone doesn’t solve. You cannot market yourself out of a strategy problem (climbing up a ladder on the wrong building). Furthermore, if you have a bad product or service or poor operations then customers you obtain may have a bad experience. Therefore, obtaining more customers into a system that cannot support it (ie Marketing) can often cause more harm than good. After working with so many companies I started to see trends. I intimately learned what I like and don’t like about different types of businesses and ventures. Recognize companies when I find them – so we can be their marketing agency or I could eventually invest in them. Help other entrepreneurs, including certain ones we work with, understand these criteria so they could have a higher likelihood of success. The entrepreneur(s) have chosen a fertile Niche Market to target. The leadership understands financial statements & tools like cashflow, budgets and the balance sheet. I want to be clear that these criteria are not the ideal investment for everybody. For example, some people may seek to create products with mass market appeal. Based on what I’ve observed creating a mass market product that competes with many big players directly is a very costly and risky approach. I find niche businesses with the ability to expand, similar to a wedge that goes wider as it moves deeper, to be much more well founded and more likely to succeed. 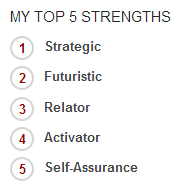 This criteria was also prepared to identify businesses that I would eventually want to invest in. This does not mean that businesses that don’t fit this criteria couldn’t thrive or be great lifestyle companies. I hope that you found my fertile investment criteria to be helpful. ps…If you enjoyed this post, please consider voting for my blog. It was recently nominated as a top 3 business blog in Florida for 2014 out of 600 total blog submissions. The winner will be announced next month. You can vote here. Thanks for your support! I almost always stay away from contributing my thoughts on racial topics, but I can’t stay silent anymore. I may offend some people who read this, but oh well. Not that it gives me a pass, but I am half black and half white so I am not coming from a bias racial perspective. The Orlando Sentinel published two articles on the same page in today’s paper. The first discussed a history making movement of thousands, primarily African Americans, banning together to rally across many US cities to march against police brutality that has claimed the lives of black men. 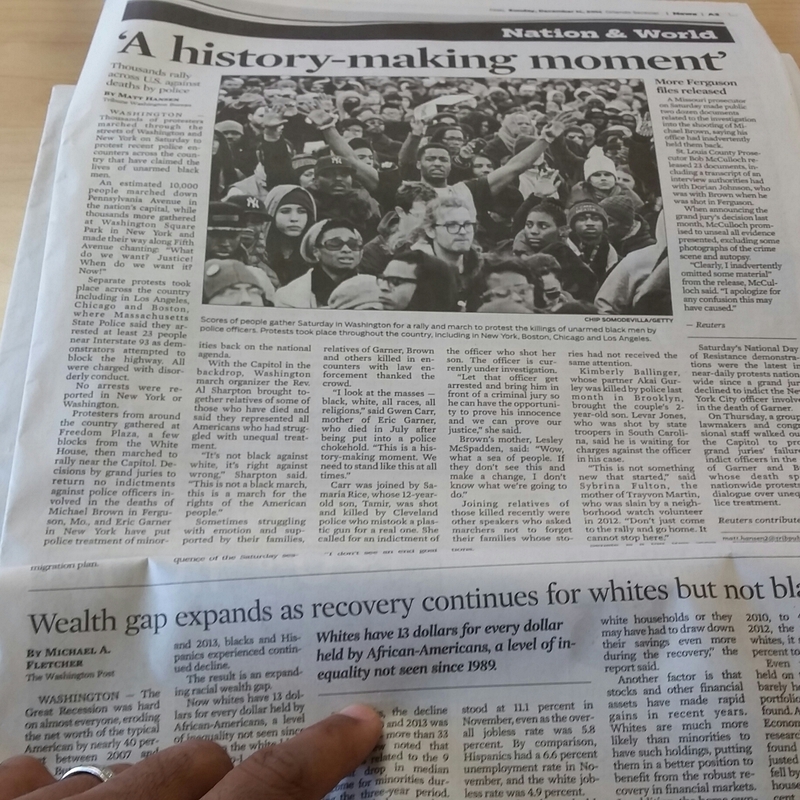 On that same page…an article about the wealth gap and the fact that the economic recovery is improving for whites, but not blacks with stats to prove it. It indicates that the average white person has $13 for every $1 held by a black person. Crime, poverty, lack of high paying jobs and poor education are much more common in depressed economic communities regardless of race. The history of mistreatment and intentional repression of African Americans put Blacks in a deep hole in this country. Many African Americans grew up and live in these depressed communities. 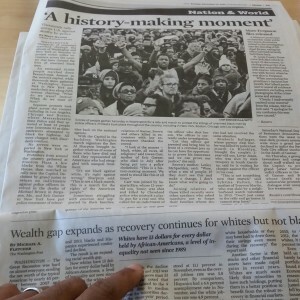 Based on the stats of the bottom article, African Americans are far more economically depressed than other races. Many of these issues (crime in black communities, poor education, charged police encounters, wealth gap, etc.) are symptoms of a much bigger problem. Economic impoverishment. The energy and time spent by so many marching could and should be spent on creating value and improving the economic circumstances and environment. That will have a much greater impact than emotional releases with no true outcome. Most who meet me don’t know I am half white. They just see African American. I have experienced racial descrimination, but make a conscious decision that the person expressing it has the problem not me. It may at times make things a bit harder, but I wont allow it to hold me back. I have been able to grow a company organically to over $1M in sales with no investment or loans. It is possible. There will always be people across any profession or community with integrity and others who lack it. Each will act as such. A much greater improvement will manifest if more people focus investing their time into learning, growing and seeking to truly add economic value rather than coordinated efforts driven by emotion addressing a system bigger than they can influence in that way. Have you caught the entrepreneurship bug yet? If not, now is the time…literally! Global Entrepreneurship week is kicking off this upcoming Monday, November 17th. Whether you are currently an entrepreneur, or aspire to become one, it is time to partake in the festivities with fellow entrepreneurs around the world…in other words it is time to get to work! 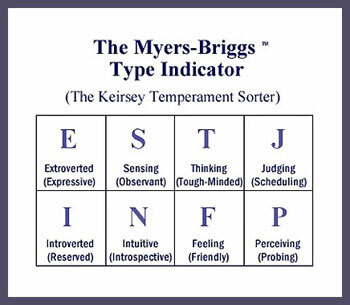 In my last post I wrote about the Strength Finders 2.0 and Myers Briggs Assessments, two resources that can help us better understand ourselves and others. We all have our own unique gifts, strengths and talents. When we come together and align our respective gifts on the common goal of solving BIG problems we can make a BIG impact. This will be occurring right in my backyard next week in Orlando, Fl as part of Global Entrepreneurship Week. 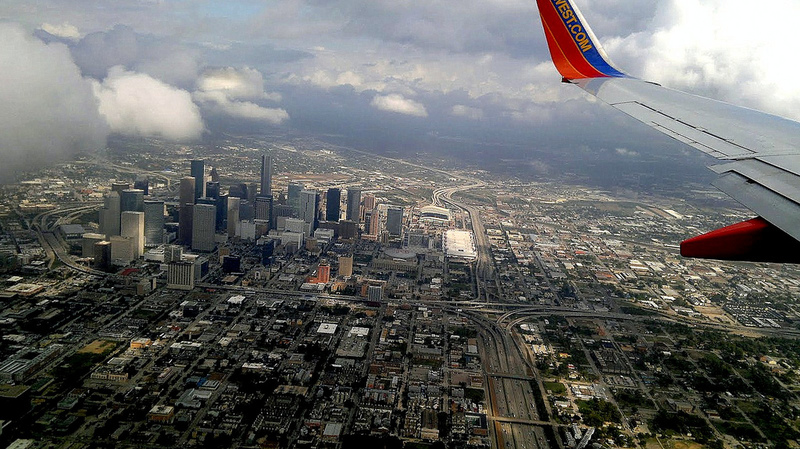 THE BIG EXCHANGE: Orlando’s Global Entrepreneurship Week Celebration. The BIG EXCHANGE is Orlando’s one week long celebration of Global Entrepreneurship Week. Teams of Thinkers, Artists, Makers & Educators will come together to solve our most pressing problems together through a series of workshops that awaken your inner entrepreneur and bring your unique gifts to the table. THE BIG EXCHANGE : Who Should Attend? If you have a passion for entrepreneurship, solving problems, and making an IMPACT….you don’t want to miss this event! At THE BIG Exchange you’ll find a great mix of people such as Thinkers, Makers, Artists and Educators. When you get great people together…good things happen. Have a desire to be entrepreneurial, but are missing an idea. Have an idea, but need a helping hand from others to bring your vision to life. Are looking to give back to entrepreneurs through mentorship and sharing what you have learned. Are an investor in Central Florida looking to make connections in the entrepreneurial community. Are a skilled artist, or maker looking to be a part of a new and exciting venture. Want to be inspired and energized through the spirit of entrepreneurship. The winning team of Orlando’s BIG EXCHANGE will earn $20,000 in prizes. This awesome prize package will help fuel the concept they created and planned into existence. To join in the celebration of Orlando’s BIG EXCHANGE get your tickets today. If you cannot make all of the events, don’t worry! You can follow the conversation and events online. THE BIG EXCHANGE team has partnered with Got-Chosen to implement a program called social exchange. This will allow you to stay connected with the event anytime and anywhere. You can also follow the conversation via Twitter by following @BIG_Exchange , the hashtag: #BIGOrl or on Facebook. THE BIG EXCHANGE: See you there! Visit www.big-exchange.com to learn more and get involved today. I will be attending a number of the events throughout the week as my schedule permits. I hope to see you there! Cheers to making a BIG IMPACT.